In a piece of bad news from last Thursday’s council meeting, Hart District Council admitted that it had no idea how much the infrastructure for the local plan would cost, nor how much it would raise from developers to pay for it, despite sitting on an existing funding gap of £78m. The detailed questions and answers can be found here. This comes alongside the revelation that Hampshire County Council has a £1.9bn infrastructure funding deficit, and Rushmoor Borough Council, £80m. We have posted before our estimate of an £150m cost of infrastructure for a new town at Winchfield, which would lead to the existing £78m funding gap being extended to £188m. We asked questions about this at the council meeting on 26 March and received some staggeringly vague answers. New analysis from Hart indicates that infrastructure costs could escalate to £300m. First we asked how much money would be raised from developers. Answer: we don’t know. And they also didn’t know how much the funding would vary according to the development strategy adopted. 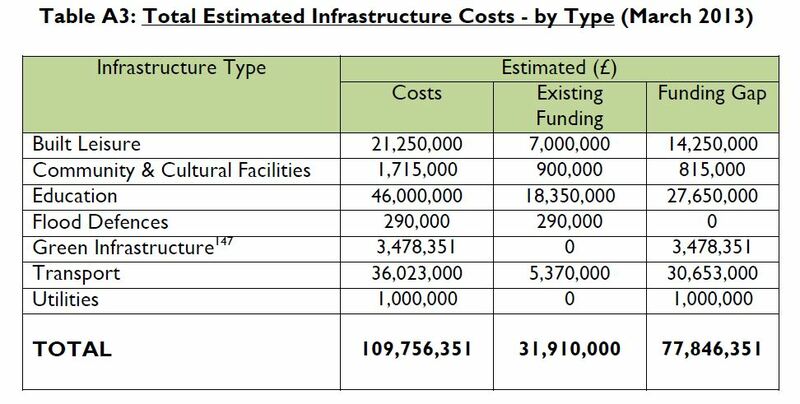 We also asked about how the infrastructure costs would vary according to the development strategy adopted. Answer: no idea. Finally, we asked if Hart understood the impact on our infrastructure of the massive development due to take place in neighbouring districts. Answer: We don’t know. We find it quite staggering that Hart as got as far as settling upon a preferred development strategy without understanding what infrastructure will be required, how much it will cost nor how it will be funded, especially as there is already a £78m funding gap. It is fairly self evident that the infrastructure required for brownfield development will be very much less than that required for a new town. It has now transpired that Hampshire as a whole has an infrastructure funding deficit of £1.9bn and Rushmoor has an £80m shortfall. Posted in Hampshire, Hart District Council, Hart Local Plan, Infrastructure Costs, We Heart Hart Campaign, We Love Hart Campaign and tagged Hampshire, Hart District, Hart District Council, Hart Local Plan, Infrastructure Costs, Rushmoor Borough Council, We Heart Hart Campaign, We Love Hart Campaign.